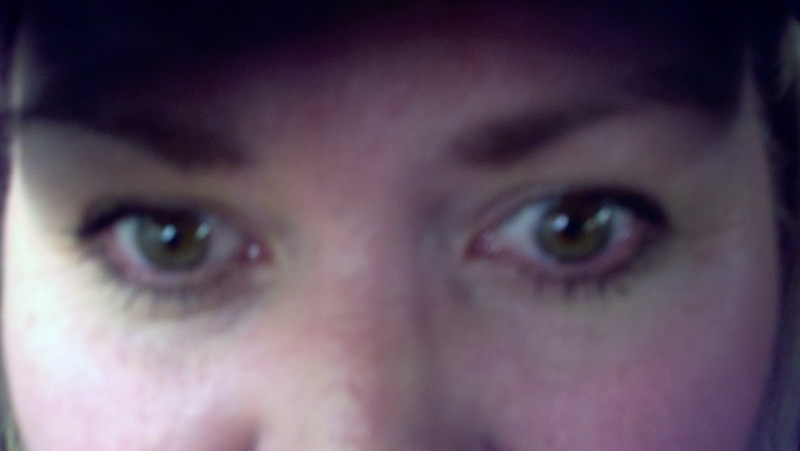 Are these tired eyes ior determined eyes??? Yes, you have that right...So many adventures in a fishing day with the River Damsel. The day started early. Ok. Very early. This voice kept telling me to go back to sleep. It was my day off already...But, like clockwork, my feet hit the floor and I was headed out for another journey. My haste to get out of the house, caused me to stop for some breakfast at McDonald's. There is a crack in the back bumper that caused it to shift. ﻿And as luck would have it...as I was stopped at the end of the driveway leaving, a not so attentive driver of a F350 plowed into the back of my car. The blunt force made me shutter at what it might look like. But, I was lucky...just minor damage. The policeman was cordial...even asked me where I was fishing. Ha. Now, the wind had really picked up and I don't know why I didn't see a sign of going home at this point. But, I agreed with Mr. Heber City Police that fishing might make my day better...Who am I to argue with the law? So, we were on our way! I made a turn into the parking lot that I had planned on going to the night before. Hmmm...Six cars already. My gut feeling was that I go across the street instead. The wind was really blowing...about 25 mph at least. And tangled lines are not my favorite thing! But, there is a cliff wall over on the other side of the river that sometimes protects the water a little more from wind. So, that is where I headed. So far this winter, I have tried this deep pool about 5 times and it has not brought one fish to my net. I could go upstream where everyone else is...no. Why do that? I wanted to land a bigger fish anyway. And there are some butes in there! My friend pulled out a nice 20 incher a month ago. So, I tied on a BWO for the top and put on a Beatis Nymph on the bottom. And twenty minutes later...Bam! And again and again! I couldn't believe it. Each time they were biting at the nymph. That was ok. My last fish finally took the BWO! Hallelujah! As my rod bent 8 different times...in a short 2 1/2 hr hatch of BWO's...I was absolutely delighted. I even forgot about the bumper I left on the other side of the fence. Where I had such a tough time catching anything last week in a thick hatch that was really too much of a good thing, now I was watching my BWO cruise ever so lightly down the path of a few friendly companions. I am far from knowing how to repeat this day...but, I will definitely keep trying. 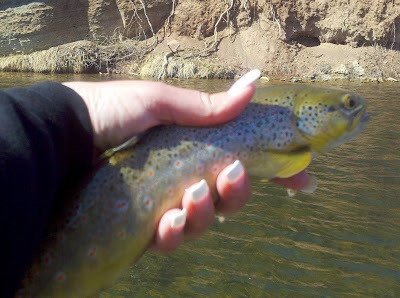 And I made someone happy when I turned downstream to tell him he could have my "All Browns, All The Time" fishing hole. Share the wealth, I say! So, today was the Good, Bad and Ugly. Let me explain...The good was that I had my day with the brown trouts! The Bad was being in a bumper car and losing the battle. The Ugly...well, it's definitely not pretty. It seems that my Patagucchi waders that were patched from a recent debacle, sprung a new leak in the other leg. When I got back to the car...my suspicions were proven right. A boat load of water emptied...ahhhh! I must have had a small tear in the other leg that we didn't see...I did fall on both knees. I guess that the bright side to this story is that both sides will match with tape! I'm so cool. Haha. Looks like you had a pretty good day except for the fender bender and the leaky waders... but who really cares about that stuff when the fish are biting? Sorry about the car. Nice browns, and the waders, been there. Anon1 - Thanks, I appreciate that! Anon2 - I know. I know. Brian - I'm sure that the bad and the ugly will not be repeated for a very long time! Alan - Thanks, buddy. I do love Mr. Brown Spots! Some days are like that. If every day was perfect, it'd be boring. Keeps life interesting. At least you didn't back into your own car...like I did about a month ago. 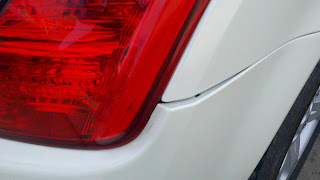 I was backing my F150 into the driveway and caught the corner of my wife's car! Totally embarrassing for a retired OTR trucker with a million plus miles without an accident or ticket! Probably a good thing I retired when I did. Mark- I think that by now...my readers know that every day is an adventure with me! Ha. Howard -- Sorry to hear about that! It's hard to keep a streak going...no matter what kind it is! Em, I guess I know why it's called Adventure in every Riffle. Maybe it should be adventure in every step. Sorry about the car...that's bad. 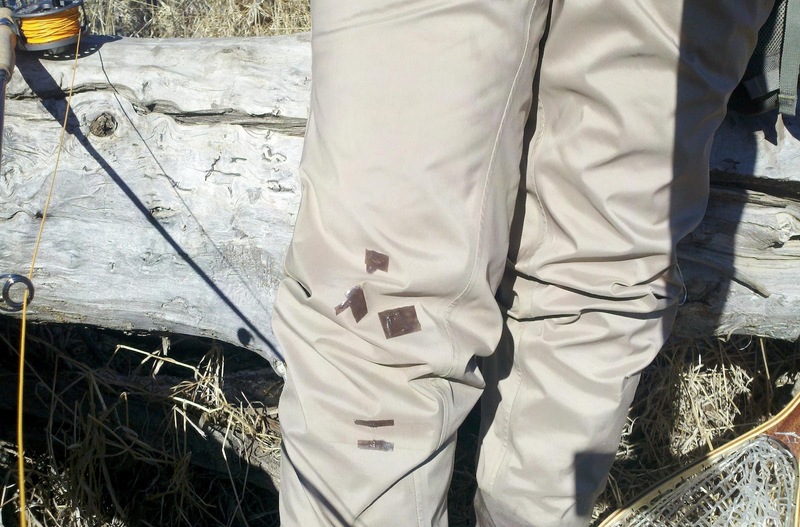 The waders are there so you don't need patches on your knees! I know you can catch fish. That is a given. 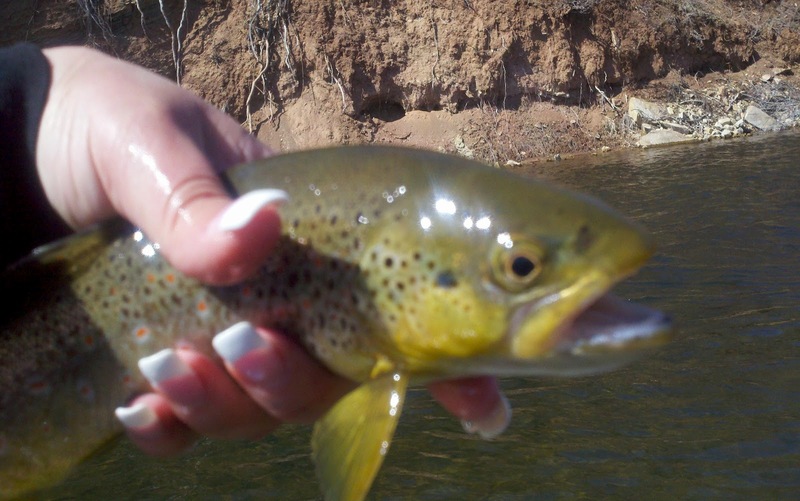 Brown trout, too! I know you do all this with one of those longer looking wands that you cast behind you with before you cast forward. I am duly impressed! What I am concerned about now is your driving backwards somewhere, and, always falling down and sometimes hurting yourself or tearing up what good clothing you got! I used to think a big ol' box of bandaid's would be all you needed for some first aid. Having just finished reading this post, I am no longer sure you might not need a ride along EMT! Howard - I'm thinking that I need to find some double reinforced knees in my next pair of waders...honestly! That is an outstanding brown even though you had to endure punishment to succeed. Sometimes a little adversity is worth the catch. I notice you seemed to use the dropper technique a lot. What size fly were you using on the drop---also what length and wt fly rod?? Thanks for sharing an interesting trip. Bil - It's the adversity that makes it all much sweeter. My Sage rod iis a 9 ft. 5wt. I put ona a 5X tapered leader. The size 18 BWO at the end of that, then 18 " of 6X tippet. Followed by a size 20 black zebra midge or a baetis nymph. A lot of guys prefer one dry fly by itself. But, on thisday...my theory of two flies proved true in my case! 6x tippet while nymphing? use the heavy stuff. you can get away with it if your nymphing. Car accidents...brown trouts...leaky waders...this one had it all (even wind). Great stuff RD! Glad you were able to get out and have some fun on the water. Anon - The only thing I felt was a sock full of cold water!